A friend recently posed the question "if you could only eat one country's cuisine for the rest of your life, what would it be?" on his Facebook page. I didn't even pause to think before responding "THAILAND!" I find the unique combination of hot, sour, salty and sweet that makes Thai food Thai food utterly addictive in its freshness, complexity and depth of flavors. 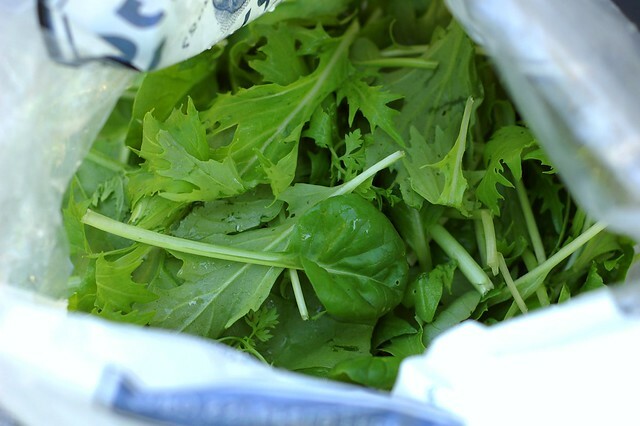 This salad is a perfect example -- you start with a bed of fresh greens and a generous amount of fresh herbs - basil, cilantro and mint. 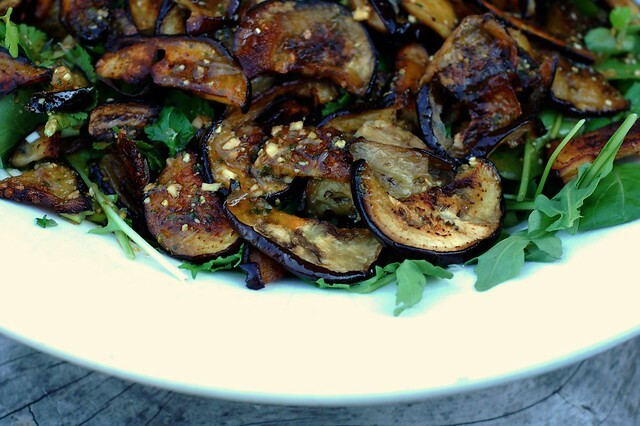 Then you add some sliced scallions or chives, top with nutty, sweet, roasted eggplant and toss the whole thing in a dressing that is a mouth-watering balance of tart, sweet and spicy. 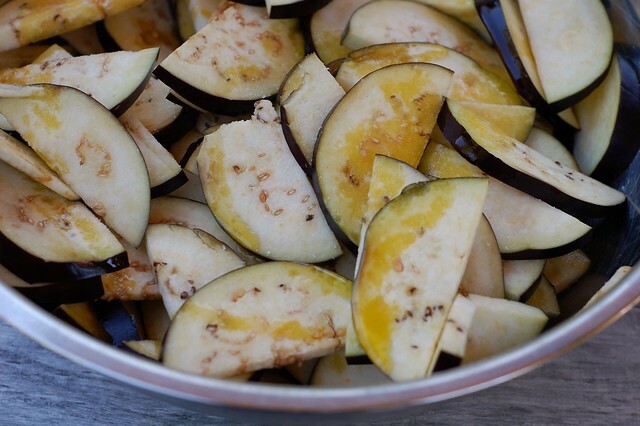 Toss the sliced eggplant with lots of olive oil and sea salt, then spread them out on a couple of heavy baking sheets and roast, flipping once in the middle to ensure even cooking. The roasting turns them into something you'll enjoy eating right off the tray - they get soft and kind of caramelized with a wonderful, nutty flavor that is at least as good as meat. The scallions provide a nice counterpoint to the sweetness and softness of the eggplant slices. 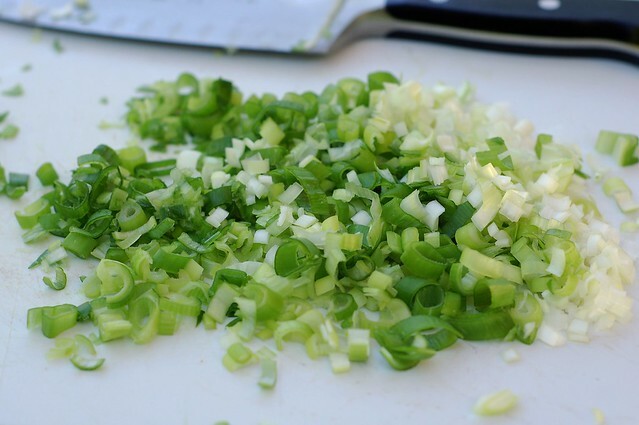 I like to chop them fairly finely to distribute the flavor and avoid getting any overpowering bites of allium. 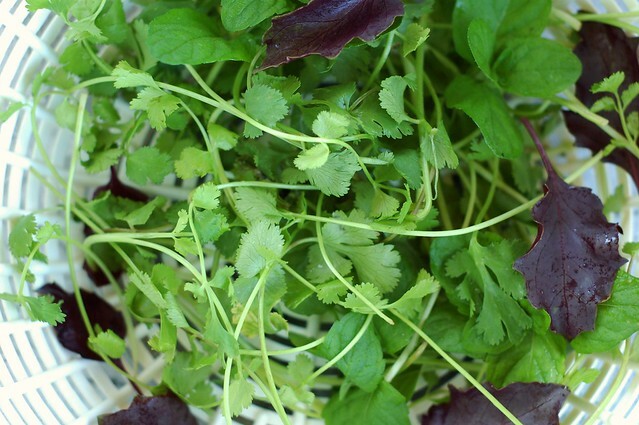 Fresh basil, mint and cilantro - the holy trinity of Thai herbs - give the salad a delightful pop with little bursts of flavor happening all over the place. I am so happy to be able to go outside and snip these straight from the garden again after the long winter. Feels so luxurious! I'm trying out this pretty purple basil (the variety is called dark opal) this year and so far, I am a big fan. And the greens make a nice, fresh bed for it all. Especially now that there are such tender young thangs growing in the garden (this bunch of lovelies came from our friend, Liza's garden). The dressing ties it all together (I can no longer use that phrase without thinking of the Big Lebowski - anyone else?) Lime juice provides all the acid you need. Then you add some fish sauce (substitute soy sauce, if you're a vegan or vegetarian or allergic), some brown sugar, a jot of Sriracha, and a little finely chopped ginger and garlic. Pour that dressing over it all and devour it. Sometimes I add some chopped toasted peanuts for a little crunch, too, but it's up to you. SO GOOD! 1. Preheat the oven to 400. 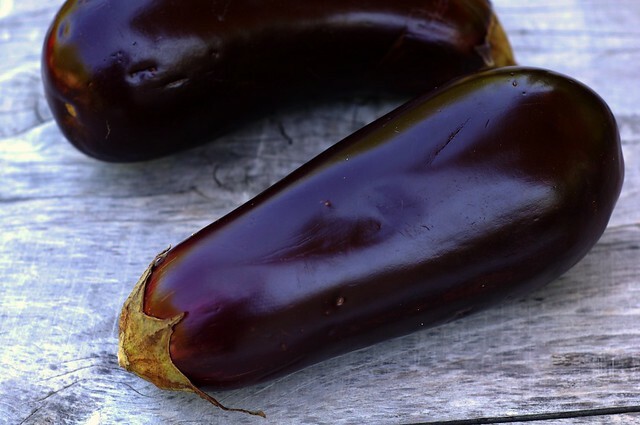 In a medium-large bowl, toss the eggplant slices with a lot of olive oil (eggplant is like a sponge so do your tossing quickly to help ensure that the oil gets distributed evenly before it gets absorbed) and several generous pinches of sea salt. 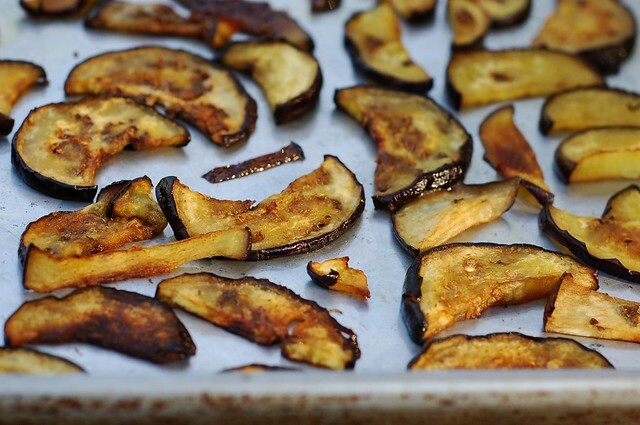 Turn the eggplant slices out onto two heavy baking sheets and lay them out in a single layer. Roast for 15-20 minutes then remove the trays and flip the slices over. Return them to the oven and roast for another 10 minutes or so before removing them to cool. 2. 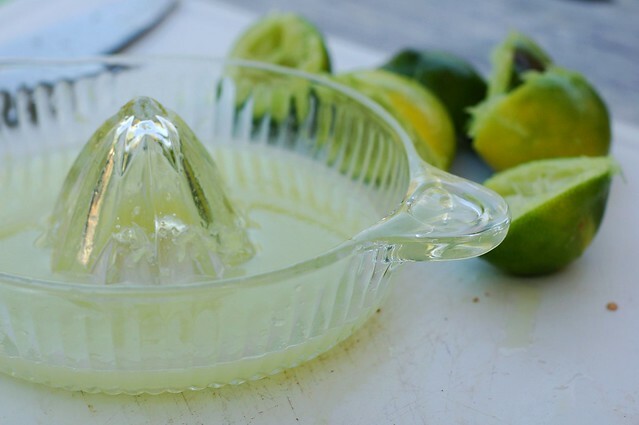 Make the dressing - just mix all the ingredients together in whatever order you like and stir or shake well until the sugar has dissolved. Taste it and adjust the flavors, as needed. 3. 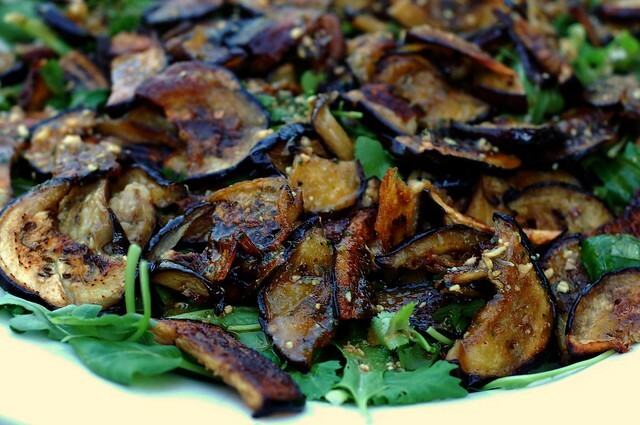 Lay the greens and herbs in your serving bowl and top with the eggplant slices (you can either use them as is or cut or tear them into smaller pieces). Sprinkle with the chopped scallions and peanuts (if desired), add the dressing and serve.